Riders poised for the tightest showdown in the history of the AquaX UK Enduro Championships in Minehead this weekend. This weekend the popular holiday resort of Minehead on the Bristol Channel will host the final round of the 2018 P1 AquaX UK Championships. And in the 8 years of the championship there has never been a tighter finish to the season. 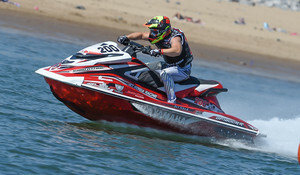 The three-round series kicked off in April on the English Riviera in Torquay where big waves and high winds was a rude awakening for the 30-plus riders who had signed up for what’s known as the toughest jet ski racing series in the world. After a year’s sabbatical, a leaner and meaner Phil Pope returned to the water in search of another AquaX UK Pro Enduro championship title that would take his tally to four. The 40-year-old from Clowne near Rotherham showed he had lost none of the flare that won him three straight titles between 2014 and 2016 when he took a hat trick of wins in Torquay. Former two-time champion Russell Marmon was the best of the rest but a long way off the pace set by Pope who looked like he had never been away from the series. The reigning champion Joe Harvey could only muster a fifth-place finish, but was lucky to even make the first round having spent the previous 5 months convalescing after breaking his ankle in the final event of 2017. However, despite his obvious pain and frustration at not being able to compete at the same level that had won him both the UK and European titles in 2017, he managed to finish all three races and get some points on the board. Round 2 in Porthcawl on the South Wales coast brought sunshine and calm conditions. The racing was more about horsepower than rider skill and therefore a real test for the mechanical endurance of the craft. The GP1800’s of Dave Huddleston and Phil Pope were out in front from the start but mechanical issues with both craft saw the Kawasaki Ultra’s of Tim Batte, Russell Marmon and Joe Harvey take all three steps on the podium. Going into this weekend’s third and final round of the season, Phil Pope leads Russell Marmon by just 6 points and despite his slow start to the season Joe Harvey is just 15 points behind in third. So with 75 points up for grabs the Pro Enduro title is up for the taking. In the Am 300 class Carl Lofthouse has been stacking up the wins aboard his Kawasaki Ultra after making the transition from the Am 200hp class where he won the title in 2017. Lofthouse has won 5 out of the 6 races ahead of the rising talent of rookie racer Dennis Taylor, who won the first race of the series in Torquay, and he goes into the final round 23 points ahead of Taylor. Wayne Lucas has been busily accumulating points and now sits in third overall. In the Am 200 class one of AquaX’s all-time most winningest riders Duncan Johnstone is poised to take his fifth AquaX UK title. After six races Scotsman Johnstone has shared the wins with Welshman Nigel Williams and now just 4 points separate the two going into the final round of the season. Another Welsh rider Graham Roberts sits 29 points behind in third place. Minehead Bay is going to be busy race arena with the P1 AquaX EuroTour joining the UK championship, and spectators will see 50 riders from seven countries in action over the two days. The very fast rise and fall tide in Minehead, with a range of more than 12 metres, could make for exciting racing especially if there is some wind in the Bristol Channel.